"Reviewers say this sheet set is extremely high quality and worth the price." "The cool, crisp feel you love for a budget-friendly price." "Will wick moisture away and keep you cool all night. " "Made from long-staple Egyptian cotton, which is regarded as the best." "The cotton is free of pesticides and other chemicals." "Known to be one of the softest, strongest, and most absorbent options out there." "These easy to care for sheets come out of the wash with minimal wrinkles." "Boast an impressive 22” pocket on the fitted sheet." "This set has everything you need to make up your bed." Reviewers can’t get enough of the Brooklinen Classic Core Sheet Set. This set of percale sheets comes with a flat sheet, fitted sheet, and two pillowcases, and you can choose from a variety of neutral colors or simple patterns. The Classic Core Sheet Set comes in all the standard sizes, and the fabric is made from 100% long-staple cotton. The percale weave features a 270 thread count for a cool, crisp feel that’s perfect for those who get hot during the night. Plus, the fitted sheet, which has a 15” pocket, includes labels on the long and short sides to help you make the bed more quickly, and the pillowcases feature envelope closures to ensure your pillows stay put. Reviewers say the Brooklinen Classic Core Sheet Set is extremely high quality and worth the price. Many note that they stay cool through the night, making these sheets ideal for summer. High-end sheets can be rather pricey, but you don’t have to break the bank to get a nice set of percale sheets. The Threshold Vintage Wash Solid Sheet Set is a highly-rated option that will give you the cool, crisp feel you love for a budget-friendly price. These sheets come in all the standard sizes, and the set includes a flat sheet, fitted sheet, and two pillowcases. The fabric is made from 100% cotton in a percale weave, and the fitted sheet can accommodate mattresses up to 18” deep. Reviewers write that they absolutely love these sheets, as they’re soft, cool, and light. Plus, many like that the fitted sheet includes an extra layer of elastic on the corners, helping the sheets stay in place. Inexpensive percale sheets are often made from a cotton-polyester blend, which can make them less breathable. If you’re looking for 100% cotton sheets that will wick moisture away and keep you cool all night, your best option may be the 280-Thread-Count Pima Cotton Percale Sheet Set from L.L.Bean. This sheet set comes with a flat sheet, a fitted sheet with a 15” pocket, and two pillowcases, and you can choose from a variety of pale colors. The fabric is made from 100% long-staple cotton, providing a smooth feel and long-lasting durability. Reviewers say these are great sheets for a great price, writing that they’re breathable, soft, comfortable, and durable. Want to sleep in a lap of luxury every night? Then you need the high-end Parachute Percale Venice Set. This set comes with a fitted sheet, two pillowcases, and a duvet cover, and you can choose to add on a flat sheet if you want. The Parachute Percale Venice Set is available in all the standard sizes, and you can choose from six neutral colors, such as sand, powder blue, light gray, and more. The percale fabric is made from 100% long-staple Egyptian cotton—widely regarded as the best cotton available—and the duvet cover features twill ties in each corner. With reviews that say things like “I look forward to going to bed every night because I have the most comfy bed in the world,” it’s pretty easy to justify splurging on these luxury sheets. Many varieties of cotton are treated with pesticides and other chemicals during growth and manufacturing. If you strive to keep chemicals out of your home, you’ll definitely prefer a set of organic cotton sheets, such as the 400-Thread-Count Organic Cotton Percale Sheet Set. This set comes with a flat sheet, fitted sheet with a 16” pocket, and two pillowcases. The percale fabric is made from 100% organic cotton, and you can feel good about purchasing this product, as it’s Fair Trade Certified. There are only two colors to choose from, but they’re neutral enough to match just about any bedroom decor. For a super luxurious sleep experience, you can’t go wrong with Egyptian cotton sheets. This long-staple fiber, grown in Egypt, is known to be one of the softest, strongest, and most absorbent options out there, and you can experience its benefits for yourself with the Premium Egyptian Percale Sheet Collection. These luxurious percale sheets have a 400 thread count and are made from 100% Egyptian cotton. The set comes with a flat sheet, a fitted sheet with a 15” pocket, and two pillowcases, and the material is said to get softer with every wash. Plus, these sheets are made to last for years to come, which can help you justify the expensive price tag. If you need more convincing, just read the glowing reviews, where people call these sheets exquisite and luxurious. One of the downsides of percale sheets is that the fabric is prone to wrinkling. If it bothers you to have wrinkly bed sheets, you may want to look for a set of wrinkle-resistant percale sheets, such as the JCPenney Home™ 300tc Easy Care Solid and Print Sheet Sets. These highly-rated sheets come in a variety of bright colors and fun patterns, and they’re available in all the standard sizes. Each set includes a fitted sheet, flat sheet, and two pillowcases, and the fitted sheet on full-size sets and larger can accommodate mattresses up to 17” deep. The 300-thread-count fabric is made from a 60% cotton, 40% polyester blend that makes it easy to care for, as it can be thrown in the wash and comes out with minimal wrinkles. These sheets boast thousands of positive reviews from users who say the color is vibrant and the fabric is soft and smooth. Plus, you can’t beat the affordable price of these percale sheets. Certain mattresses, especially those with a pillowtop, can be quite thick, making it challenging to find sheets that will fit properly. If you have a deep mattress, your best option for percale sheets may be the Abripedic Crispy Percale Sheets, which boast an impressive 22” pocket on the fitted sheet. This set comes with a flat sheet, fitted sheet, and two pillowcases, and you can choose from nine colors and queen or king sizes. The sheets are made from 100% cotton woven into a 300 thread count percale fabric for a crisp, breathable feel. Reviewers write that the sheets fit well and are high-quality—some even go so far as to call these the perfect percale sheets. 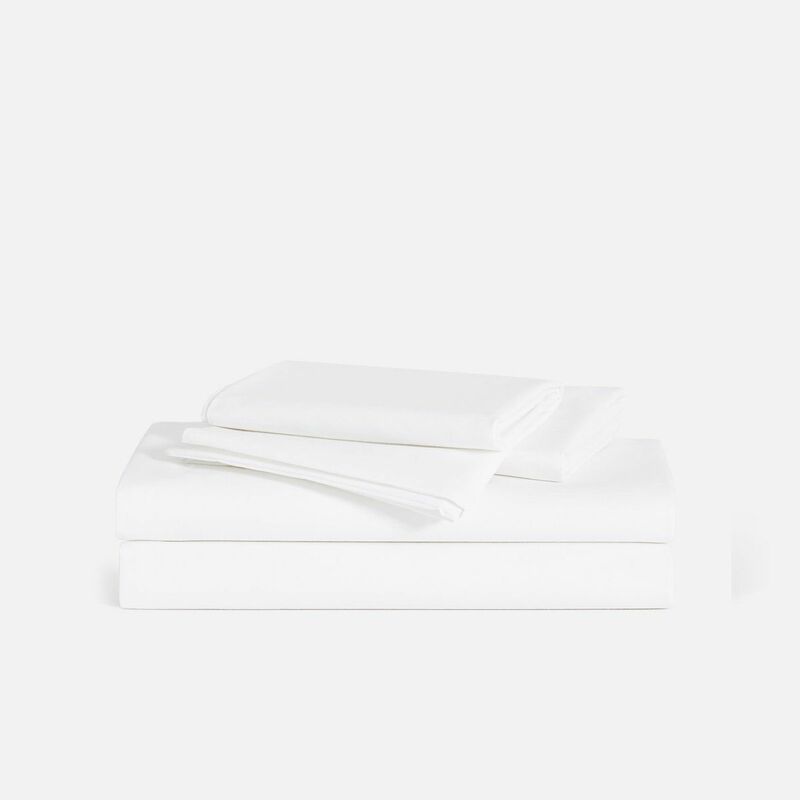 Some companies sell each piece of bedding separately, but if you just want to buy a complete set of percale sheets, check out the Snowe Percale Sheet Set. This product has everything you need to make up your bed, and it doesn’t have any reviews less than 4 stars! With each set, you get a flat sheet, fitted sheet, and two pillowcases. These percale sheets come in five muted colors and all sizes except for twin. The fabric is made from Egyptian cotton, and the 500-thread-count percale is lightweight and crisp. Reviewers say the Snowe Percale Sheet set provides “a luxury hotel feel,” and there are no reviews less than 4 stars out of nearly 900 total. These sheets are that good!